Roberto Lorenz was born in England, and began playing the guitar as a child. His travels have taken him all over the world, with performances in England, France, Spain, Mexico, and the Middle East. Currently living and performing in the United States, he continues his love for the older style flamenco that is deeply routed in the Spanish gypsy soul. There are so many phenomenal guitarists these days, it’s hard to choose. The modern style has taken the flamenco guitar to heights that were never dreamed of by earlier guitarists. Paco de Lucia was largely responsible for this new era of the flamenco guitar, and his influence has changed flamenco for all time. Sometimes though, combining Jazz cords and tonalities with flamenco has somewhat taken away from the pure feel of the music. Technically these new guitarist are amazing, but my preference is for the older style of guitarists like Melchor de Marchena. His style is considered to be old fashioned by most people today, and although he has been gone for many years, his music still has a clear and clean quality that is the very essence of flamenco”. These days everyone wants to play like Paco de Lucia, and why not? He was brilliant. But for myself, I knew I would never have the technical ability to play his style, so I find the older style to be more appropriate for my tastes and for my abilities. I think the key is to try to find your own style and not worry about what anyone else thinks. Just play what you feel and feel what you play. The real question to ask a flamenco guitarist is... who is your favorite singer? The answer to that question will tell you much more about the guitarist. The song is the heart and soul of flamenco, and the singer is the most important part of the flamenco tradition. My favorite living singer...Pansequito (José Cortés Jiménez), because he can sing old style and new style with absolute purity. 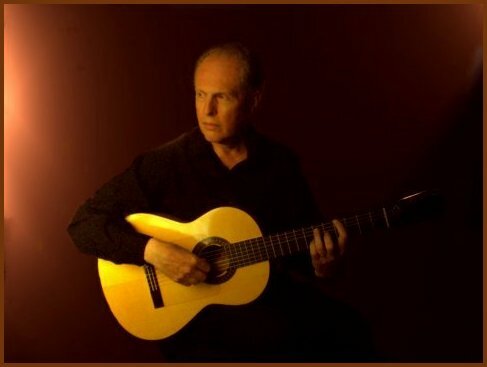 My favorite living guitarist... Pascual de Lorca (José Pascual Ruiz), a little known guitarist from Jerez, who plays in a beautiful soulful traditional style. He is a wonderful accompanist. He has wonderful technique and emotion, and one feels his vulnerability and his inner struggle with the music.